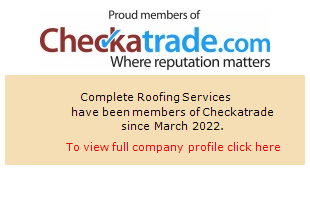 We are an established Roofing Company serving Surrey Kent West Sussex and The London Area. We are equally at home on both new and existing Roofs and produce outstanding workmanship. Our friendly team of professional Roofers adopt a methodical approach to their work that minimises disruption to your day-to-day routine. For the very best in installations and Roofing repairs, call us today for a free estimate and Expert independent advice. Complete Roofing Services are your number one choice for unrivalled workmanship on all commercial and residential properties. 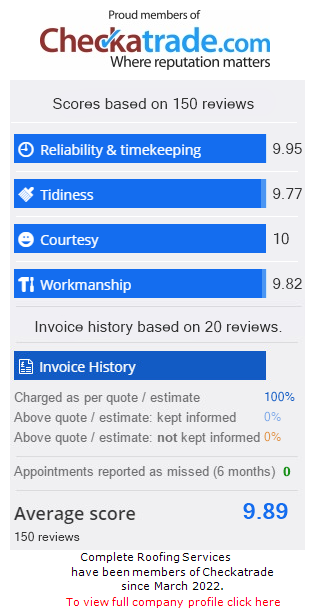 As ‘Checkatrade’ members with outstanding customer reviews, our 29 years of trading experience continues to see us earning rave reviews and plaudits as the number one Roofing Company in South East England. Excellent service. We have used the roofing company over the last couple of years and will continue in the future. We felt that the cost he quoted for the job was slightly on the high side for the work involved, but were grateful for the promptness with which he responded to our problem. Great work, very reliable and efficient roofing company. Great job as per usual. We have used this firm for the past 16 years. Works requested were completed in good time with a friendly service and follow up. Price as quoted. and all other roofing related work.